This book should be read by anyone who experiences frequent and serious conflicts/bullying. Hopefully, the "victim" and "the invalidator" will both be able to read it, it helps with both coping from the attacks and how to recognize the attacks. 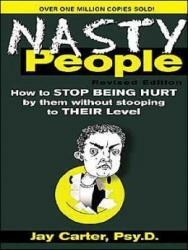 "Nasty People..." empowers the victim of bullying to understand they are not helpless and they too have a responsibility to solve the problems. Nasty people behave like this ultimately through their own choice, ("made" not "born") and thus, they can do something about it and change themselves.